ALMEMO® 2490 A compact measuring instrument with more than 65 measuring ranges, one measuring input and one output interface. Memory for 100 measured values. Plus 4 internal function channels. A/D converter delta-sigma, 15-bit resolution. Option U Please check the compatibility chart for MA2450, MA2490 & MA2590 Instruments. Click here for other technical details. Important Note: Please check the compatibility chart for MA2450, MA2490 & MA2590 Instruments. RS485 interface, built-in, including Option U.
IP54 protection (if water-proof connectors are used). Professional measuring instrument ALMEMO® 202 provides numerous outstanding functions for special applications using digital ALMEMO® D6 sensors and the latest ALMEMO® D7 sensors. 2 ALMEMO® input sockets for all digital ALMEMO® D6 and D7 sensors and for ALMEMO® standard sensors with the DIGI measuring range. ALMEMO® 2890-9 Precision Datalogger; 9 inputs; 2 outputs; complete with Case ZB2490TK2 and mains adapter. ALMEMO® 2890-9 Multi-function measuring instrument and data logger with 9 measuring inputs, 2 outputs for USB, RS232, Ethernet, analog. 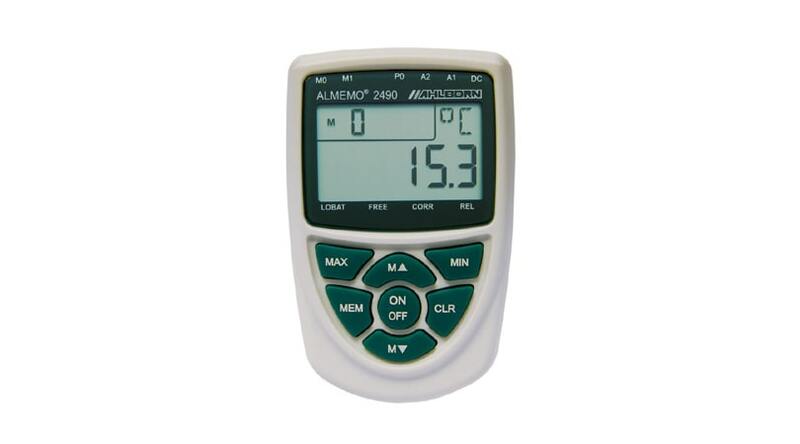 ALMEMO® 2690-8A Precision Datalogger; 5 input; 2 outputs in Case Set with USB or RS232 data cable. ALMEMO® 2690-8A Multi-function measuring instrument and data logger with 5 measuring inputs, 2 outputs for USB or RS232, Ethernet, analog. Professional Measuring Instruments with 1 measuring input. Data logger with integrated memory and integrated sensor for temperature, atmospheric humidity and atmospheric pressure. Segmented color display with bright, white illumination, Clear and easy-to-understand display of measuring and programming values in 5 different colors. Alarm display against a red background.